This Document Envelope is a refined way to keep all your documents neat and organized. Made with a slim envelope silhouette, this travel document envelope is perfect for storing documents while on the go, or even as a presentable way to have them accessible on your desk. 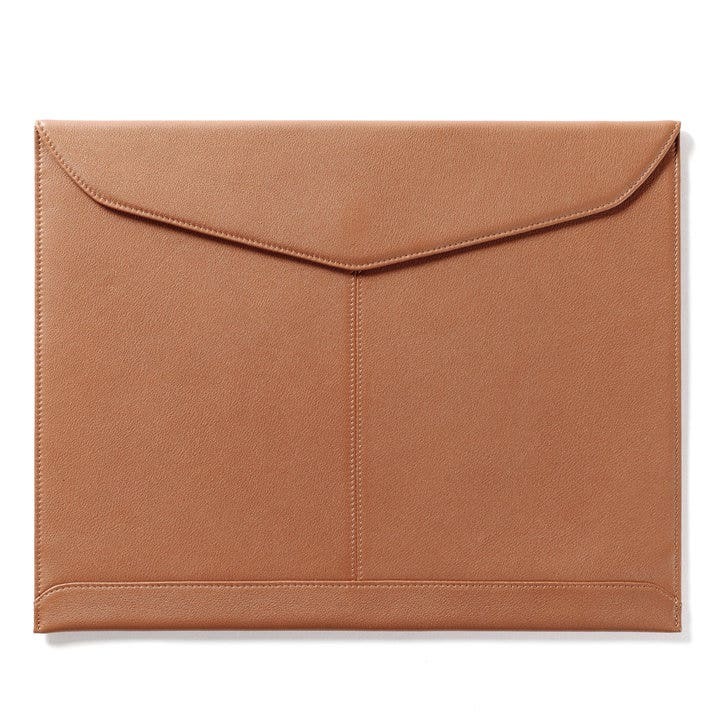 Perfect for professionals or your home office, this leather Document Envelope will keep all your important forms at hand. Over and beyond what I was wanting! Great product, great presentation! Opening it felt like Christmas!! A+++++. Thank you! I bought this document envelope for a Christmas present. It looks very sharp and the recipient already opened it and loves it. Got the document holder for my son’s important papers. Beautiful leather, rich color (cognac), perfect size, elegantly wrapped. I’m sure he will love it - cannot wait to give it at Christmas. The gold box makes it such an impressive gift. I was surprisingly please with the procurator when it arrived. It looks to be nice, quality leather and fine craftsmanship. I was blown away with the packaging. This was a treat for myself, and now I’m looking at who needs this as a present. Exceedingly fast delivery. Packaging first rate. Ordered another item. I often find myself with small stacks of paper I need to carry around. Instead of using a manila or file folder where paper can easily slip out, I thought this would be a safer and more sophisticated option. The leather is soft to the touch and lovely. This is my first Leatherology order and I am pleased. It is not large enough for legal size paper but it holds quite a few documents and letter sized pad. My only complaint is that it doesn’t have more structure. It’s a little floppy. Not enough to crease the paper inside though. I will get a lot of use out of this and I think it will last for years. Love this bag. Perfect for travel. All products come beautifully boxed. This is exactly what I had been looking for. It holds plenty of very important documents while retaining it's sleek look. Whether it is for the home, with birth certificates, wills, etc., or to attend meetings with contracts to be signed, it is professional and timeless. A very nice product at a reasonable price. I will likely buy another product from this vendor if the need arises. The gift packing gives instant surprise upon receipt of the delivery. Very quality and soft leather in pretty colour. The emboss is done well. Overall impressive and way cheaper than any branded products of its kind in boutiques. Will definitely recommend to friends.